As a busy mom of four always hungry Little Men and one regular Hubby Man, I am always on the look out for super yummy meals that I can make for a good price and that I can whip up really quickly. Recently I went to a great source for family and budget friendly recipes, my latest issue of All You Magazine. After running to the oh-so-lovely and forever-my-favorite-store Target to grab the April edition, I poured over all the recipes. I found a TON of recipes that I instantly wanted to try. One of my favorite set of recipes was the Feed Your Family: 1 Week, 5 Easy Meals. I picked a few and put them into my Weekly Menu Plan. 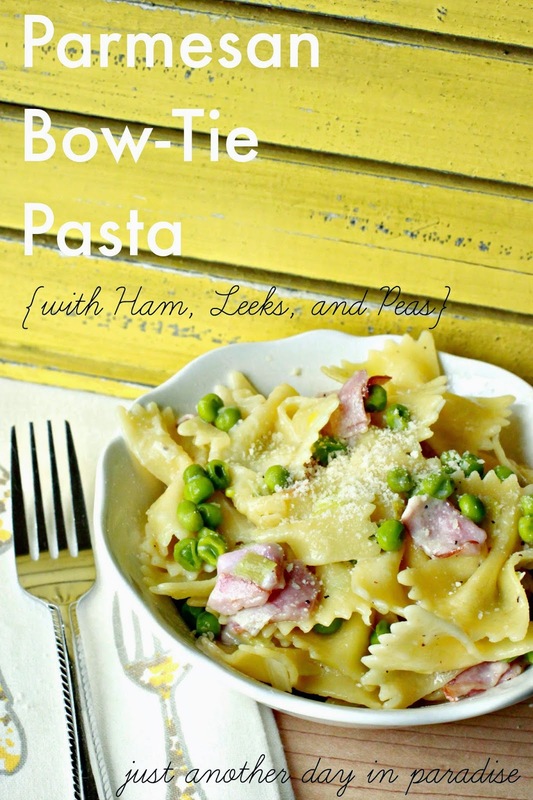 The first recipe I tried was this awesome Parmesan Bow-Tie Pasta with Ham, Leeks, and Peas. Instant crowd pleaser for my hungry rowdy crowd. The meal came together SO easy. I mean like WAY easy. I put it all together quick enough that the villagers didn't have hardly any time to raise a famished riot. Then once the villagers were happily devouring their food there was not a single word to be heard. Okay, maybe there were a couple of muffled sounds between bites. After all they are rowdy boys. I didn't alter the recipe at all. 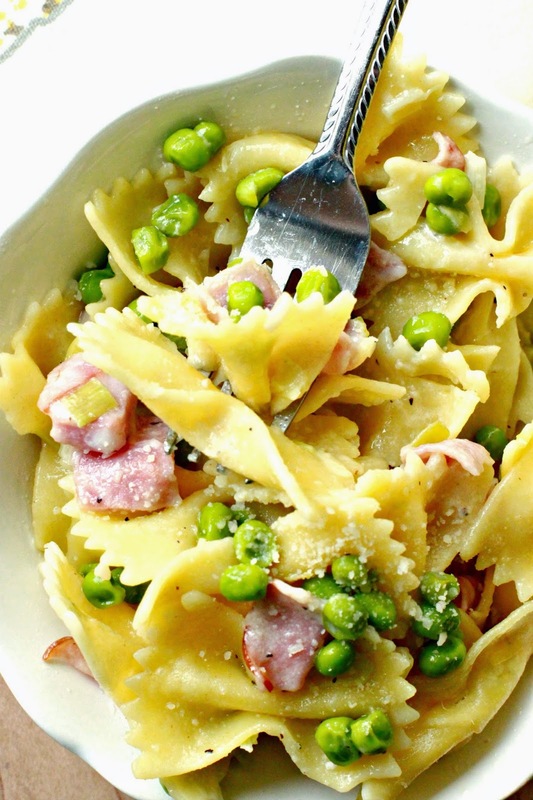 This pasta dish turned out perfectly and it will make it on to the Weekly Menu Plan again. We also made the Baked Chicken Spring Rolls. Man those were tasty as well. I love that they have family friendly recipes with a grocery list that went with it. 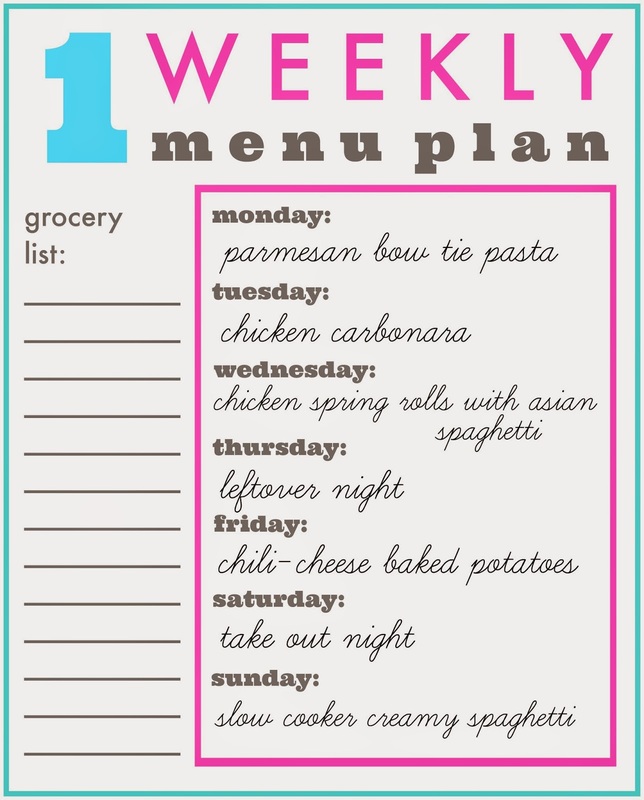 Not only was I inspired by these yummy recipes from All You Magazine, but I was also inspired to put together a Weekly Menu Plan printable. One I can print out and hang on my fridge. I typed up my weekly menu onto a blank form. 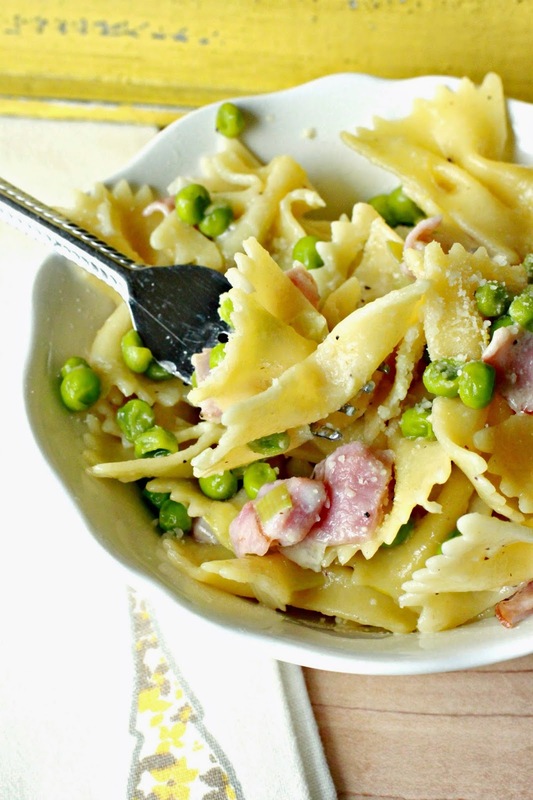 I know this Parmesan Bow-Tie Pasta with Ham, Leeks, and Peas will make it back in our menu rotation very soon. Bring a pot of salted water to a boil. Cook the pasta until al dente, about 10 minutes. Melt butter in a large skillet over medium heat. Add the leek and cook, stirring often, until softened, about 3 minutes. Add in the peas and half and half and bring to a boil over high heat. Reduce to low and simmer until thickened, about 5 minutes. Stir in ham. Season with salt and pepper. Drain the pasta, reserving some pasta water. Add the pasta into the skillet along with the cheese and toss to coat. Add some of the reserved pasta water if the pasta seems dry. 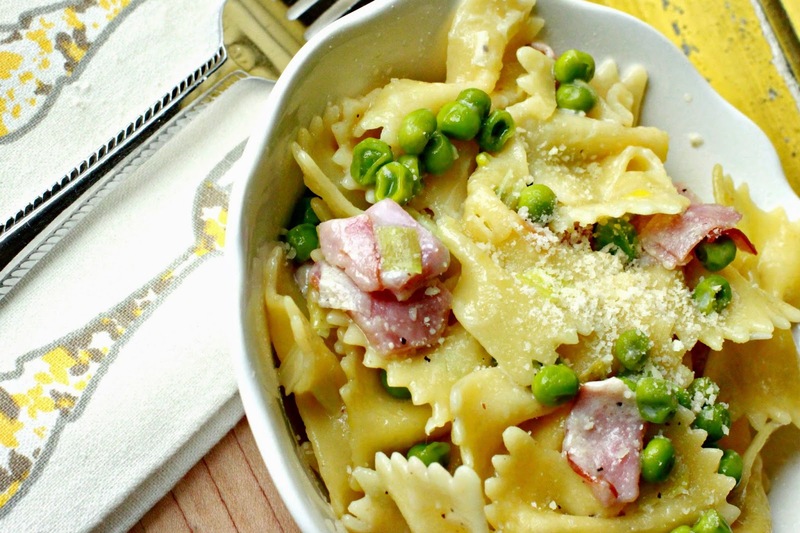 Serve immediately with more Parmesan. I am telling you, you need to try this recipe out. You should also try the Baked Chicken Spring Rolls. Heck, all the recipes in the April All You Magazine look amazing. Run to Target, like I have to really tell you to do that. 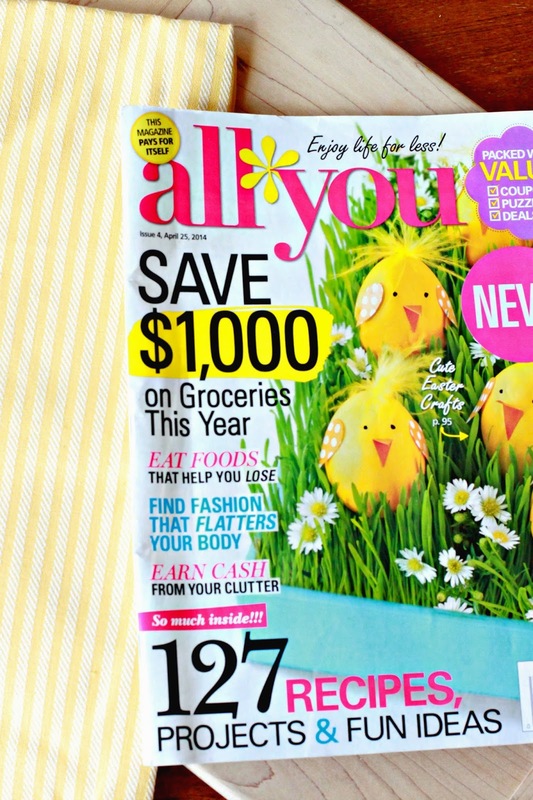 So go to Target, like I know you want to anyway, and pick up the April issue of All You Magazine. Print off your $1 off coupon HERE (while supplies last). Also, since we all love Target how about a little giveaway. You know like a $50 gift card to Target giveaway. Feel free to jump up and down. I won't judge. I mean $50 gift card to Target...that is awesome. AWESOME! Me too, Adrienne, me too! Ha!